Camille Saint-Saëns was born on the 9th October 1835 in Paris into a poor family. Misfortune struck when he just three months old - his father, a clerk in the French Ministry of Interior, died of tuberculosis. His mother and his great aunt brought up Camille in strained circumstances, and it was the latter who taught him music. His talent was a prodigious one. By the age of three he could name any note by ear, and had completed a composition for piano - presumably with the help of his great aunt. By the age of ten he could play all of the thirty two piano sonatas of Beethoven from memory. At the age of eleven he gave his first public recital at the "Salle Pleyel" where he was hailed as a second Mozart. Later that year he won a prize from the "Société Sainte Cecile" and his first symphony was produced the next year (1847) by the same Society. From 1852 until 1857 he was organist at the Church of Saint-Merry and in 1858 he became the organist of the most fashionable church in Paris the "La Madeleine", a post he held until 1876. These posts were both prestigious and well paid, assuring financial security. Franz Lizst heard him play and declared him the greatest organist in the world. In 1875 Saint-Saëns married the 19-years old Marie-Laure Truffot some 20 years his junior and fathered two children. Unfortunately the marriage proved to be a disaster, though perhaps through no fault of either partner. In 1878 his two-year-old son André fell from a high window and was instantly killed. Overcome with grief, Marie was unable to feed the six-month-old baby who was then sent to her mother for care, but failed to thrive and died only six weeks after André. Saint Saens, rightly or wrongly blamed Marie for the tragedy and their relationship fell apart. He deserted her while they were on vacation in 1881, writing to tell her that he could no longer live with her. The never met again, but didn’t divorce, and Marie, heavily veiled, attended his state funeral. She lived until 1950 reaching the grand old age of 95. Despite his family tragedy, this period was undoubted the most productive of Saint-Saëns career, and most of the masterpieces for which he is chiefly remembered date from this time: the Dance Macabre(1875); Samson and Delilah(1877); the Second Symphony (1879); the second Violin Concerto (1879); the third Violin Concerto (1883); the Carnival of the Animals (1887) and the Organ Symphony (1887). None of these works even hint of the dark tragedy of his life. The second symphony is a large-scale composition with many innovative ideas of form and structure. The first movement is all built out of a simple motif consisting of a chain or thirds falling and then rising. This is heard clearly on the strings at the start. The main body of the movement is a stormy allegro in which the chain of thirds is decorated in different ways and presented in different orchestral textures. The construction avoids conventional sonata form anticipating to some degree the compositional techniques favoured by Elgar, Sibelius and Janacek. The slow movement is a short and tentative adagio in the dominant key of E major. The stormy mood returns for the scherzo, which starts with a fast and dramatic section. A slower second part follows which is quiet and gentle and in the key of A major. Saint-Saëns departs from conventional use of form by not repeating the first stormy section creating in effect two short contrasted movements. The final movement is a rondo based on a lively dance tune. It is full of drive and energy and is light hearted throughout. 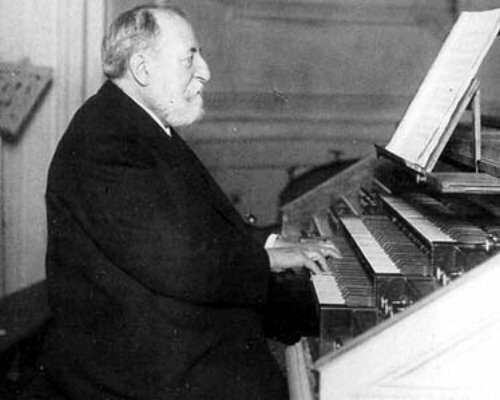 As he grew older his popularity declined and Saint-Saëns became increasingly reclusive. He preferred the company of his dogs to other humans. His main passion, apart from music, was travel and he visited many countries including Ceylon, Egypt, Vietnam, Argentina, the United States, Russia, Scandinavia, Sri Lanka, Algeria and Uruguay for which country he composed the National anthem. It was during a trip to Algeria that he contracted an infection from which he died on Friday December 16 1921 at the age of eighty-six. Saint-Saens' Second Symphony was performed by the Portobello orchestra on the 10th December 2005. The conductor was Anthony Weeden.